Applications are now open for students to participate in inaugural pilot of the Curtin Tax Clinic. 3. Written Expression of Interest (why you want to assist in the clinic). Applications close on Friday, 25 May 2018 at 5pm. 2. In penultimate or final year of study. Note: students will be required to commit at least 5 hours per week to assisting in the clinic. This may involve some Saturday morning or evening work, depending on the clinics ability to meet client needs. The CTC will be the first program of its kind to be adopted into the Australian tertiary education framework and intends to bridge the gap between technical knowledge gained through coursework and the practical rigors of the workforce. The CTC aims to enhance the education of Curtin students by offering participants the chance to immerse themselves in a practical workspace. Under the supervision of experienced tax practitioners, students will work closely with clients of the CTC to resolve their tax related issues and develop fundamental skills to aid in their future careers. Students who successfully participate in the program are expected to gain valuable practical experience to better prepare them for professional work after graduation, and to respond to the dynamic demands of the workplace. In addition to the CTC's clinical function, the initiative will strive to facilitate a number of industry engagement events throughout the year. Students who are interested in tax networking opportunities will be able to connect with industry professionals and develop positive professional relationships. If you are interested and wish to find out more please contact either Annette Morgan (via email at annette.morgan@cbs.curtin.edu.au or phone 08 9266 7106) or Donovan Castelyn ( via email donovan.castelyn@curtin.edu.au or phone on 08 9266 2741). Thursday 8 March is International Women’s Day (IWD), and UN Women is hosting their annual IWD Breakfast from 7am – 9am. This is a global day celebrating the economic, political and social achievements of women. It is also a day to review how far women have come in their struggle for equality, peace and development. This year’s theme: ‘No Woman Left Behind’. Tickets are on sale now and can be purchased from https://unwomen.org.au/take-a…/events/perth-iwd-breakfast-2/. For those who can’t obtain a ticket, UN Women Perth is seeking 30 volunteers to assist in the morning and throughout the breakfast. The event runs from 7am - 9am, but volunteers must be at the venue by 5:45am for a briefing. They must also attend the two Compulsory Training Sessions to be held on Monday, 19 February 2018 from 5-6pm and Monday, 26 February 2018 from 5-6pm at the KPMG offices. If you are interested in volunteering, please send your full name, email address, contact address, confirmation of availability for the 2 training sessions and for the event to angel@drawhistory.com by 31 Jan 2018. If you have any queries, please contact to Vuma Phiri on wellbeing@csls.asn.au. Interested in volunteering? The Glenn Brown Memorial Grant Committee is looking for new volunteer committee members in 2018. The committee raises funds for the Glenn Brown Memorial Grant, which is presented to researchers at Resphealth for research into cystic fibrosis. It runs small fundraisers throughout the year, finishing in a large luncheon at Frasers on Melbourne Cup Day. For more information or to get involved, please contact carrclaudia@outlook.com. There is an opportunity for a current LLB or double degree student (enrolled in either the tax elective or BCom with a taxation major) to assist with the production of policy and marketing documents for an exciting new initiative driven by the Department of Taxation. The successful candidate will work closely with Donovan Castelyn and Annette Morgan at Curtin University. They will be largely responsible for the drafting and collation of the abovementioned documents. The role will be on an ad-hoc and as needed basis. Commencing mid-late February. 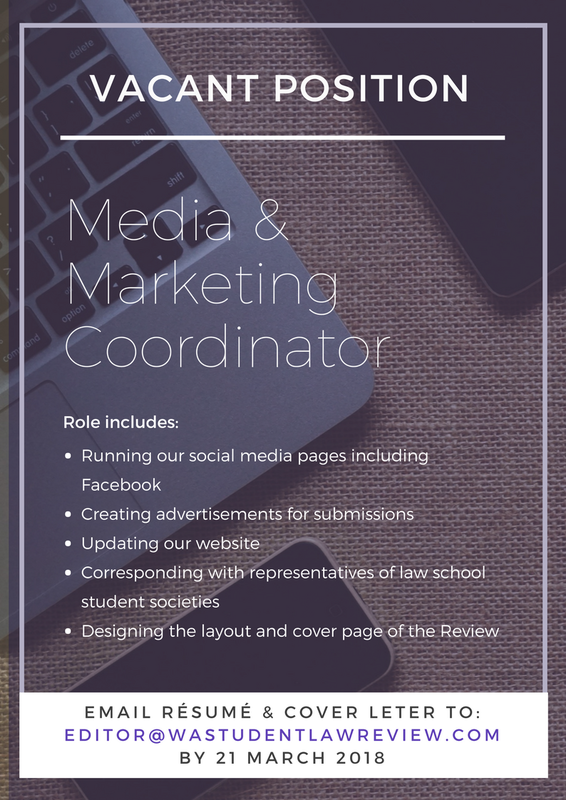 The Australian Law Reform Commission provides opportunities for current law students to work alongside Commissioners and legal staff as legal interns. They are receiving applications for the Semester 1 program until 5 February. The ALRC accepts students who are in their penultimate or final year of an undergraduate or graduate law degree, at the time of the internship, from any university including overseas institutions. work experience, or interest in, law reform and/or social policy development. The ALRC may request that applicants attend an interview as part of the selection process. Do you have experience in the successful provision of high level, confidential secretarial, administrative and paralegal support services? The Corruption and Crime Commission is looking for a confident, highly motivated and astute individual to assist our Legal Services Directorate. We are looking for an individual that is aligned with our values: integrity, relationships with others, accountability, leadership and teamwork. A busy commercial legal firm, with an office located in the heart of Fremantle overlooking the cappuccino strip, is currently taking applications from students in second year and above for unpaid work experience 1-2 days per week. The position will see the successful applicant carrying out various tasks on commercial litigation files including research and assisting our professional staff. May lead to paid work. McLeods is a WA law firm specialising in local government law. It is currently welcoming applications for potential graduate positions that may arise in the coming months. For further details and inquiries, contact McLeod's General Manager, Brian Kingston at bkingston@mcleods.com.au or (08) 9424 6218. 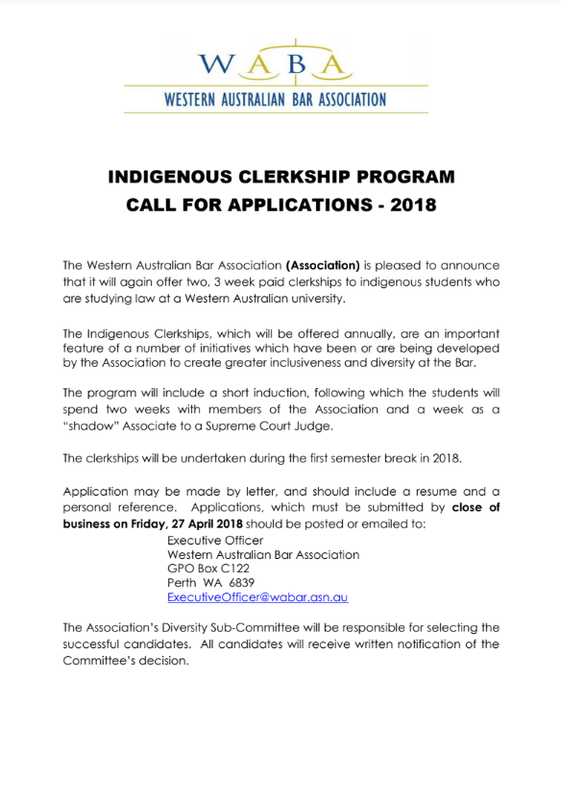 Applications are sought from law graduates for the position of Orderly/Support Officer to Appeal Justices Murphy and Mazza of the Supreme Court of Western Australia. The Orderly/Support Officer provides clerical and administrative support to the judges. This is a full-time position and the appointment will be by contract of employment for a period of 12 months. The position is available for commencement on 1 January 2018. The position requires the applicant to provide the judges with a high standard of support in and out of court. For further information, please see the Supreme Court of Western Australia's website at http://www.supremecourt.wa.gov.au/C/careers.aspx. Perseus Mining Limited (http://www.perseusmining.com/) is inviting applications for an intern (unpaid) to gain work experience. § Work experience position for 1 to 2 days per week for a period of 6-12 weeks commencing now or early next year. Flexible hours to work around study and other commitments. Please submit your application to Martijn Bosboom, General Counsel & Company Secretary, at Martijn.Bosboom@perseusmining.com by 5pm on Wednesday 18 October 2017. There are opportunities for up to 3 intern positions (over consecutive periods). Just a reminder that this is not a Curtin University-supported/affiliated opportunity and, if you are successful, you will be undertaking the work directly with the organisation and not through Curtin. The Chamber of Commerce and Industry WA (CCI) has provided the following list of current non-legal internship opportunities for your convenience. For further information, please contact Ben McGinty at ben.mcginty@curtin.edu.au. Get experience with a luxury product range, creating content for social media and schedule posts. Work with a dynamic agency, writing and creating content for blogs, web sites, and social media. Work with a company to develop standard processes and procedures for their newly implemented MYOB system. Work with a global company, performing detailed analysis of the Property industry, working with major clients. Volunteering opportunity for penultimate students.